Geez louise, does that cover look good or what?? The title alone is composed of four of my all-time favorite adjectives: sticky, chewy, messy, gooey . . . well, uhh, four of my favorite dessert-themed adjectives, anyway. With a title like that, how can you go wrong? 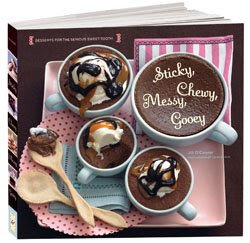 For more info on Jill O'Connor's newest cookbook, Sticky, Chewy, Messy, Gooey, click here.